There are three periods throughout the year that I consider to be opportunities for renewal due to their transitional nature: the new year (duh), spring time and the month of September. While it would be unfair to play favorites, to hell with it: I have a particular fondness for that delicious in-between weather that September so miraculously nails year after year. Perhaps it has something to do with the end of summer being associated to back-to-school, which is synonymous to new beginnings, renewal and organic progression. But that September breeze, that early fall sunshine, it's all somewhat magical. The smell in the air changes, the light becomes this powerful glow that we all chase until we no longer can and the foliage morphs into a real-life masterpiece. It's no wonder I have a special place in my heart for that cool, crisp atmosphere that September so sweetly brings on. The days are warm and the nights are cool, which is perfect for getting back into the layering groove and dabbling in the first manifestations of fall fashion. For me, it's an oversized chambray shirtdress and a fresh lightweight cotton scarf, basking in the radiance of golden hour. Great photos, I love your dress, this blue is perfect for you! love the outfit.. casual and comfy! NYC looks so beautiful in the autumn sun and love your shirt dress! I adore the clutch, simple yet stylish. I love your shirt dress Hélène! That pouch is TO DIE! I feel like monogramming is the new black, Lol! Team Ian + Helene: Killer! First off.. LOVE these photos! The lighting and background make your outfit stand out 10x more! Love this look and that clutch is amazing! I'm there with you.. I love the transition time. Where I can still wear short sleeves and sandals, but can also break out my sweaters and boots! Love how you styled the denim dress with the neutral little booties! Love your hair too. Wow, what a beautiful look, I love everything about it :) The photos are also really pretty! I adore your look, so effortless and those photos are amazing! Those pics are everything , I'd love to be back in NYC! Feel free to check out my lastest blog ! This is so perfect! 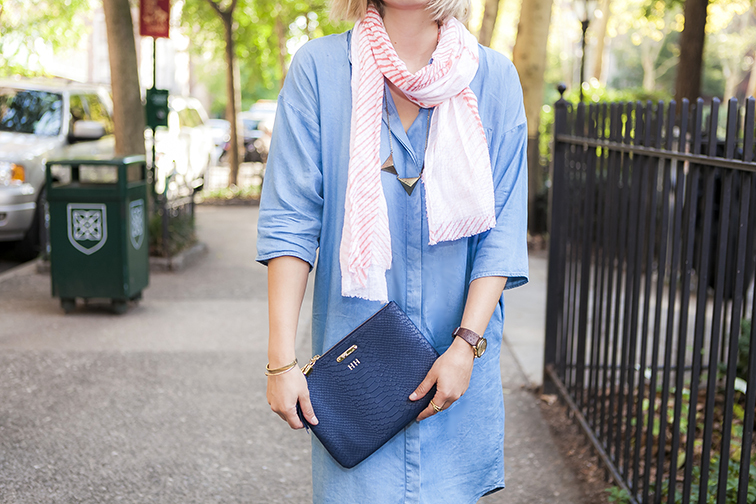 I have a chambray tunic dress, and I've never worn it with a scarf...now I'm wondering why! I just love the breeziness of this dress. I really love this laid-back look! Wish I could rock that hair length by the way, it looks so great on you! I love when the weather transitions. It's not to cold or warm. Just a crisp breeze in the air. Great dress and I love your booties. Love a bit of lens flair and these photos are sooo dreamy. Wish I could do September dressing as effortlessly as you but as usual, that pesky UK weather keeps me on my toes. So I'll leave the house to that cool, crispness you describe but in a few hours I'll be a hot mess thanks to some rogue humidity! Nice touch with the monogramming on the clutch *heart eyes emoji* I NEED a monogrammed Whistles clutch in my life. Adoring your beautiful pictures and style right now. Fall is my favorite season, and I too associate it to back to school. Well, maybe because I have a kid..haha! I love September too (and not only because my birthday is this month), and your look is perfect for this kind of weather ! Love your dress and booties ! I love your look !!!. Yes it does have something to do with the whole back to school thing. Love the denim and rugged bootie look with a NYC chic twist! Effortlessly gor! great little clutch. Love that! Stunning. Really... It's the first word that came up.